(1) The magnetic field produced at a point P by a long, thick, straight cylindrical copper wire of radius R carrying a steady current I is plotted against the distance of the point P from the centre of the wire. 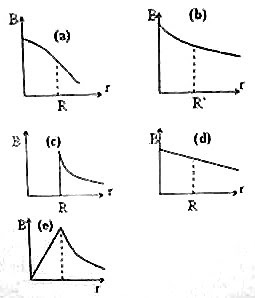 Which graph among the five options shown in the figure represents the correct plot? If you remember that the field is directly proportional to the current I and inversely proportional to the distance r, you can solve the above problem. In the case of points within the wire, the magnetic field is obtained by replacing the constant current I with the variable current i in the equation, B =µ0I/2πr. The field within the wire is thus directly proportional to the distance r.
The correct plot is shown in figure (e). Since PQ and DA carry like currents (currents in the same direction), they attract each other. You can easily show this by Fleming’s left hand rule (motor rule).. Since PQ and CB carry unlike currents (currents in opposite directions), they repel each other. The attractive force is greater than the repulsive force in this case since the separation between PQ and DA is greater than that between PQ and CB. [Remember that the force is directly proportional to the product of currents and inversely proportional to the separation]. The loop therefore will move towards the straight conductor. At the loop, the magnetic field produced by PQ is directed perpendicularly into the plane of the figure. Therefore, the magnetic force on side AB is upwards and that on side CD is downwards. Since the magnitude is the same, the resultant of these two forces is zero The lines of action of these two forces are not separated . So, there is no torque. 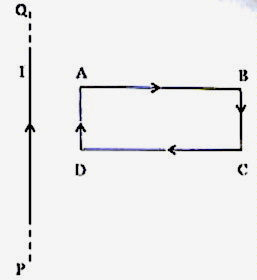 The lines of action of the forces on BC and AD also are not separated and again there is no torque. This is a question in which Flemings left hand rule (motor rule) will help you. It is better that you treat the ions to be positive (for the time being) so that you can hold the middle finger of your left hand along the direction of projection (upwards). The forefinger should indicate the direction of the magnetic field and hence must point into the plane of the figure. Then the direction of the thumb which is held perpendicular to the fore finger as well as the middle finger gives the direction of the magnetic force. The direction is leftwards for the positive ion. Since the ions in the question are negative, The deflection is towards right. Since the ions are of the same charge and the same velocity, the heavier ion is deflected less (because of greater inertia). Therefore its path is OD. r = mv/qB, you will immediately note that r is greater for the larger mass m.
(4) In a mass spectrograph, positive ions moving with different velocities in the positive X-direction are admitted into a velocity filter in which an electric field of magnitude E is applied in the negative Y-direction. What should be the direction of the magnetic field so that ions of the same velocity pass through the velocity filter without deflection? As you might be knowing, the velocity filter is an arrangement in which electric and magnetic fields are applied at right angles so that the deflection produced by the electric field is cancelled by the deflection produced by the magnetic field. In other words, the electric force and the magnetic force on the ion are equal and opposite. Since the electric field is in the negative Y-direction, the electric force (on the positive ion) is in the negative Y-direction. 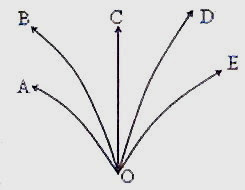 The magnetic force must therefore be in the positive Y-direction. (5) In the above question, if the electric field is E, what should be the magnitude of the magnetic field so that ions of velocity v and charge q proceed undeflected through the velocity filter? You can expect more questions in this section in due course.